These montages are such an interesting challenge. You never know in advance what pose will come up next, so getting them to fit together compositionally is sometimes like attempting to make a jigsaw puzzle out of mismatched pieces! I like the way these poses came together though, and when she decided to do the last pose lying down, it gave me that nice horizontal element across the bottom. This surface is a black archival drawing board. I coated it front and back with matte medium to protect and seal it, as well as provide additional tooth. The matte medium keeps the paint workable a bit longer also, since the water doesn’t absorb into the surface. After sealing the board, I put a stencil rid over it, and sprayed it with diluted interference and iridescent acrylics to give it some visual texture, depth and shimmer. Then I painted the figures in acrylics over the top. It will be clear-sealed again, this time with gloss medium, and varnished. That way, it can be framed just like an oil painting, without glass. $130.00 plus $10 shipping and insurance within the Continental United States. For local sales, shipping charge will be allocated to NYS Sales Tax. Please email me at JamieWG@aol.com for International purchases or with any questions. 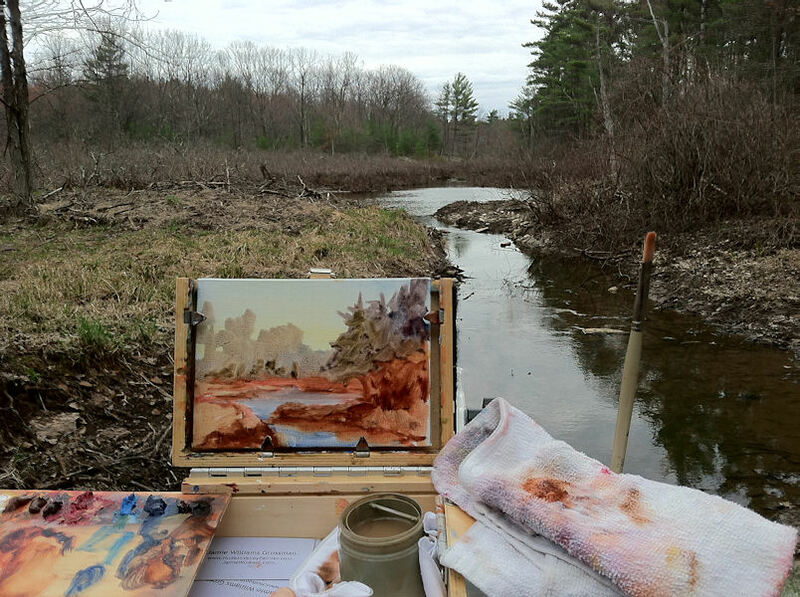 This was painted last week on an exquisite spring day, with the Piliated Woodpeckers dancing around in the trees, flashing their red crests and bright white markings. This vista faces Kaaterskill High Peak way in the distance, which is one of the major Catskill landmarks. 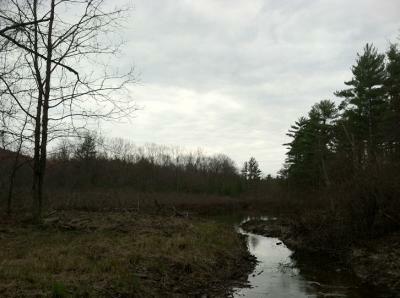 The red maples were just starting to bud. I’ll bet by the time I get back there in a few days, the scene will already look totally different. $535.00 plus $25 shipping and insurance within the Continental United States. For local sales, shipping charge will be allocated to NYS Sales Tax. Please email me at JamieWG@aol.com for International purchases or with any questions. I went hiking with my friend Gretchen to this spectacular waterfall. The light was perfect and conditions ideal, with record-breaking March temperatures and no bugs! 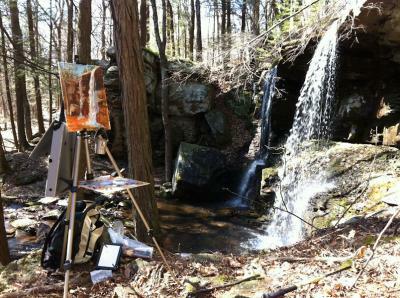 I found a spot to set up my easel that was high up, next to the falls. Generally I view it from below, so it was great to find this additional vantage point. Here’s a photo of my painting in progress at the scene. You can click the image to enlarge it if you’d like. It’s been so warm this winter that I’m getting concerned about the potential for drought. 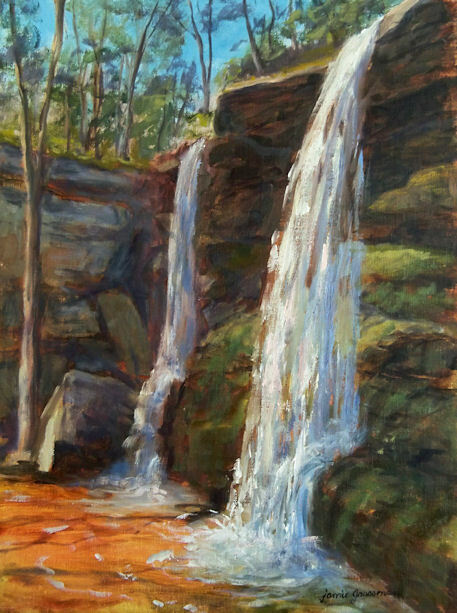 That could mean a severe waterfall shortage for my paintings too! 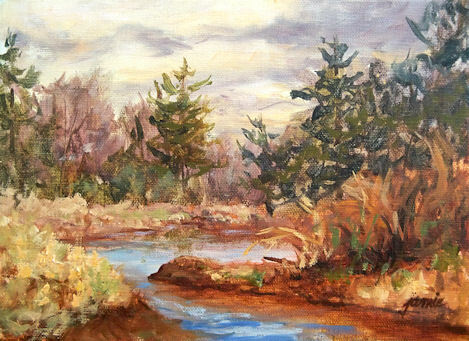 I’m trying to get in as much water painting as possible before all the streams and creeks coming down from the mountainside run dry. Hopefully we’ll get abundant rain in April and that won’t happen, but just in case, at least I’ll have gotten in a few of them early on this season. My friend Jani came over a couple of days ago to paint. In spite of a decent weather forecast, it looked like we were going to get rained out! So, I opted for a small painting close to home. We walked back behind my house to where the beaver dam used to be, and I set up to paint on a small island in the stream. Here’s what the scene looked like when I began, so you can understand why we thought rain was on the way! I did my block-in while it was still pretty overcast, but slowly that gave way to clearing skies. I tend to get so involved in painting that I forget to take some photos as I go. 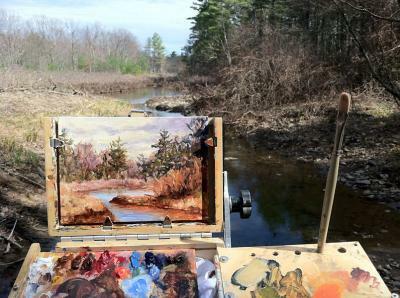 Two days last week, I was so excited to go out painting that I even forgot to bring along my cellphone and camera! Everybody always comments that they really enjoy seeing the scene along with the painting, so I am going to try to remember to do this more often this year! I hope you enjoyed seeing some of the progress shots and location photos. $295.00 plus $25 shipping and insurance within the Continental United States. For local sales, shipping charge will be allocated to NYS Sales Tax. Please email me at JamieWG@aol.com for International purchases or with any questions. This figure montage was done in open studio life drawing from poses that ranged from 30 seconds to 20 minutes. I prepared a 16×20″ black and iridescent support in advance, then layered the poses on top of that background. I did blue and purple figures on the shortest poses that began the session, since those colors tend to recede. I layered warmer colors over cooler colors, and let the poses overlap and interweave. Great fun! 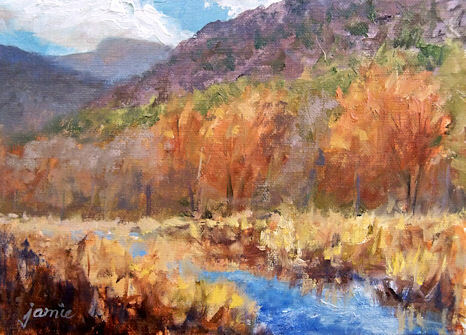 This painting was done as an acrylic on board so that it can be framed without glass like an oil painting. The archival board was sealed on both sides before painting. It will be signed and then receive two isolation coats, followed by a coat of beautiful gloss varnish. It will fit any standard 16×20″ frame. $100.00 plus $5 shipping and insurance within the Continental United States. For local sales, shipping charge will be allocated to NYS Sales Tax. Please email me at JamieWG@aol.com for International purchases or with any questions. This is a watercolor painting from open studio life drawing last week. We had a fabulous new model. Most of the session I painted in my sketchbook, but I pulled out some nice paper for this pose. You can also see a montage of the very quick gesture poses in my sketchbook at this link. I really like the way this experiment came out, so I’ve prepared some black supports to upgrade my materials and do more this week. Stay tuned! 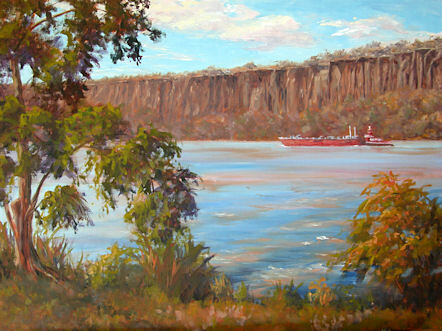 This painting is a view of the Palisades from Riverdale, New York. You can see a photo of the work in progress on this post. This is a studio painting I’m working on of the Hudson River and Palisades. It’s being painted using some plein air watercolor sketches that I did on location in the fall as references, combined with some photos. Not too much farther to go on this one, so I’m starting to see the light at the end of the tunnel. Are You Talkin’ to Me? 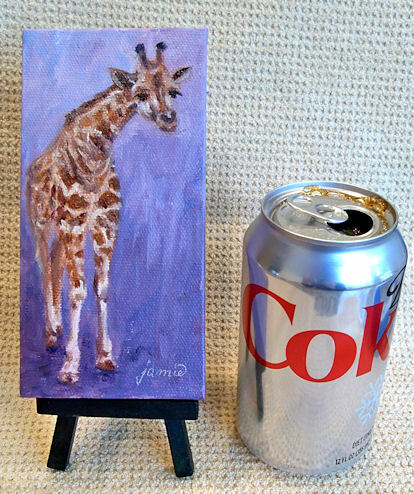 Coke can is for size reference. Color is closer to the photo above, with the more muted background. This inquisitive giraffe was painted from one of the photos I took this past week at the Bronx Zoo. (You can see my sketches of the giraffes done at the zoo at this link.) I’ve really fallen in love with their beautifully expressive faces and graceful movements. Maybe I’ll do a few larger paintings of them too. They sure do seem to fit this tall format! 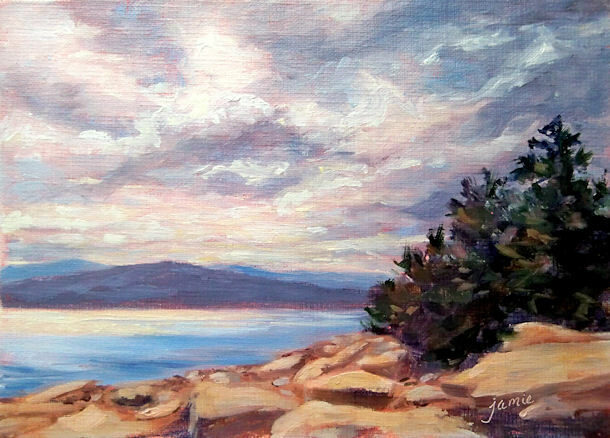 Mount Desert Island, Maine has always been one of my favorite places to visit. Acadia National park has some of the most stunning vistas in the United States, and for years we made it our annual vacation destination. We actually thought about buying a place up there, but in the end decided that the season is too short, and the location too far away, for us to get up there on a regular basis. I haven’t been up there for a few years, but every once in awhile, when I’m feeling some Maine nostalgia coming on, I pull out my photos from there and paint something. There’s never a shortage of atmosphere along the Maine coastline! My husband and I took a couple of days to drive around the Schoodic Peninsula on a photo expedition. I did this painting from one of those photos while test driving some of my new color choices.